Bamboo poles are versatile materials for a variety of craft projects. 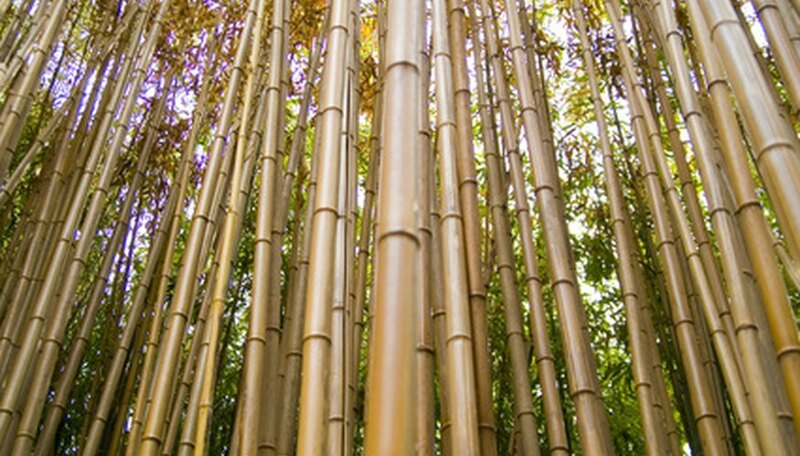 You can easily cut, drill and glue bamboo poles to create a garden fence, a fountain or a set of wind chimes. Other craft projects you can make with bamboo include patio furniture, wall art, headboards and arbors. One of the simplest bamboo crafts you can make is a privacy screen for the patio. Build the screen with any size bamboo poles, just keep the diameter uniform. Cut 2-inch diameter bamboo poles to length equal to the desired height of the privacy screen. Cut as many poles as you need to create the desired width. Measure 6 inches from either end of each pole and make a mark. Wrap a strip of clear tape around the bamboo pole at each mark. The tape will help keep the bamboo from splintering as you drill it. Drill a small hole straight through each bamboo pole on each of the marks. Remove the tape. Cut two strips of 20-gauge craft wire 20 inches longer than the desired width of the privacy screen. Bend each wire at a 90-degree angle 10 inches from one end. Thread the straight end of one wire through the top hole and the straight end of one wire through the bottom hole of one bamboo pole. Thread the wires through the pole to the 90-degree bend. Continue to thread the remaining poles over each wire one at a time. Slide the poles so that they rest against each other. Bend the end of each wire at a 90-degree angle after adding the last bamboo pole. Wrap the bent wires around the bamboo poles on either end of the privacy screen. Wrap the ends of the wires securely around the section of wire between the last pole and the adjacent pole. Cut four 2-inch bamboo poles equal to the overall width of the privacy screen. Drill holes in each pole, 6 inches from either end. Cut two 10-inch strips of 20-gauge craft wire. Connect two poles together with the wire, the same way that you made the privacy screen. You will have two sets of two connected bamboo poles. These sections make up the stand for the privacy screen. Glue one set of poles on either side of the privacy screen with waterproof construction adhesive. Place the poles horizontally at the bottom of the row of bamboo poles to make the stand.